Cook rice noodles according to package instructions. Drain and rinse thoroughly with cold water. Set aside to drain. I then laid all out my ingredients except rice papers into separate piles on my counter, this makes assembly much easier. Lay a damp towel on a counter. Fill a pot and heat water. Dip one rice paper sheet in hot water to wet completely. Set on damp towel. The rice paper should become soft and pliable immediately. Dip one rice paper sheet in hot water to wet completely [but don't let it linger as it will get too soft]. Set on damp towel. The rice paper should become soft and pliable immediately. Arrange one-twelfth amount of the chicken in a horizontal line to the bottom third (2 ½ inches from the bottom and 1 inch from right hand side) of the rice paper wrapper. Place a small portion of carrot, rice noodle, cucumber and 4 to 5 mint leaves over noodles. Place one lettuce leaf over mint leaves. Fold the bottom half of rice paper wrapper over filling. Fold the right hand side of the rice paper over to enclose the ingredients of the bottom of the roll. 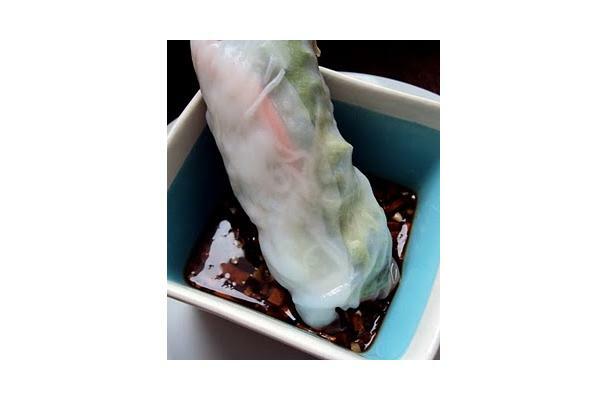 Press lightly on the ingredients with your fingers, gently roll the rice paper tightly upwards to form a cylinder log. And walla....you have a spring roll. Wasn't it easier then you thought it would be? how can thi sonly have 4 carbs? what about the wrapper? isn't that about 40 carbs by itself? Daibetic concerns. ui agree it is healthy but I think 4 carbs is too few? Spring rolls are light, tasty, very fresh and overall pretty healthy. This is my first time making them and found myself laughing out loud at myself when first trying to assemble. The first four rice papers ended up in the trash. As I played with them more and got use to them I found the rice papers easier to work with. It seems you no longer, depending on where you live, you have to go to a Asian speciality store for these ingredients. I found all at my local Kroger store.